Your essential Canon EOS-1D X camera field guide in a convenient pocketable style. 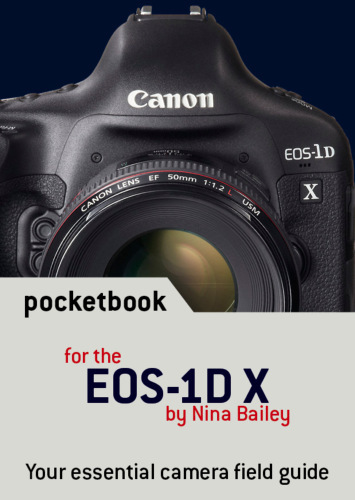 This EOS Pocketbook for the flagship 1D X is a concise guide to your camera and small enough to carry with you everywhere. Nina Bailey, Technical Editor of EOS magazine and author of the popular EOS eBook series, has the solution. This Pocketbook for the Canon EOS-1D X is a concise guide to the most used and confused features and controls on your camera, based on Nina’s vast experience as lecturer at EOS Training Academy – hearing first-hand what photographers want to know and understand about how their EOS-1D X camera operates. Excellent little pocket guild for the EOS- 1D X . Full of tips and information, Highly recommended. Packed full of information in a convenient pocked sized format. Ideal for out and about use. From my preliminary review the guide is a great tool in a very useable compact form. Having read the EOS-1DX Pocketbook, I can honestly say that it surprised me how much was actually learnt. My memory is dwindling (76 years young) so taking it in the backpack is a reassuring reminder when needed. I'm very impressed with the knowledge shown by Nina Bailey and am currently looking to buy other titles written by her.